When I told people I was Visiting Lebanon most worried; too many people they still think of it as a warzone. How wrong they were!? Next time someone tells them they are going to Beirut their reaction will be the complete opposite because my stories of Lebanon have surprised all of them for the better. I didn’t choose Lebanon lightly, in fact, this is the first time in a long while I’ve traveled with someone. Had I been going alone I don’t think I’d have had the cojones to go. Now I’ve been I can tell you that going alone would be absolutely fine, just be careful where you visit and don’t expect to meet any other Western tourists along the way. We mostly drove on this trip, but we did take one bus journey from city to city and it was really easy. 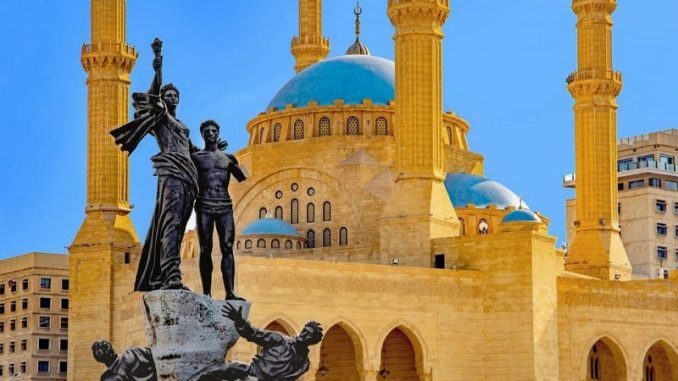 Much of Lebanon isn’t considered safe – as you’ll read we visited some places our government recommended ‘No Travel’ to but it was a bit scary at times. Public transport isn’t great and going anywhere apart from down the coast may involve lots of waiting or a costly taxi. If you are thinking about renting a car, think very carefully about it – the roads are among the most dangerous I’ve seen. Beirut is the party capital of the Middle East, so indulge. We arrived at our guesthouse at midnight so I expected it to be quiet, but Beirut is rocking! I stayed at Saifi Urban Guesthouse which has an incredible café attached to it which morphs into a bar in the evenings. Beirut is a party city and this guesthouse proves that with it staying open until about 2 am. I had no trouble sleeping here as the dorms are upstairs and in an old building which keeps the sound out well, but that would be the one thing I’d say to bear in mind if you are looking for somewhere to stay. This guesthouse was only one of two we could find online that was aimed at backpackers in Beirut and while there were plenty of other Westerners here, they were all students. I’m not a city man myself, I tend to sleep and then run to the countryside. But we did spend a day exploring Beirut. From our guesthouse, we walked to the city center and saw the Sunni Mohammad Al-Amin Mosque, which sits next to some Roman ruins which have been deeply excavated. We passed some old Roman baths, walked the Souks (which is just a shopping mall full of glamorous shops) and then along the coast to the Pigeon Rock. We stopped for some falafel and strolled back a different way without any trouble whatsoever. For all its liberalness Beirut does still show its scars; bullet holes have ruptured pretty much any building over 30 years old. But the place itself wasn’t intimidating, it wasn’t scary. Neither of us ever felt any threat in Beirut. It is a great city to relax, wondering about isn’t the best option here as large parts of the city really contain nothing worth seeing. If you want a few days at cafes and reading books then stay longer, but Beirut in one day was perfect for me. The next day is when we used a public bus. We had to go to the Cola interchange ($5 taxi) where you will arrive at people shouting the bus destinations at you. We were going to Sidon, we heard the name and sat on the bus. It was very easy to do, but I’m not sure how it is for getting around the country once you leave Beirut. We took the bus here because he had planned to visit the Jeita Grottoes, however, it shuts on Mondays (more on this later). So this was a last minute plan and it was worth it. Sidon takes about an hour and has a really nice old town, with a crusader era St Nicholas cathedral built into the ancient looking souks. We wandered the souks for a couple of hours, browsing the shops and trying some Baklava like pastries (called Katayef). Before randomly exiting to the coast where a small Crusader sea castle sat perched on the water, which was interesting to look around and the higher points give a nice view back along the coastline, Once we were done we sat in one of the roadside Cafes and ate before returning to Beirut. That night we tried to stay up and party, but by midnight we were both asleep, ready for the next day driving along the Beirut – Damascus highway. I don’t want to start every new paragraph with a warning, but I have to give you one about Baalbek. We encountered no trouble here and because we were so ignorant we walked unlit streets at night and didn’t look out for any danger. But after we left we met Lebanese people who, on two occasions, gave us good reason to not visit. On top of this, the British government warns against all travel to the area. 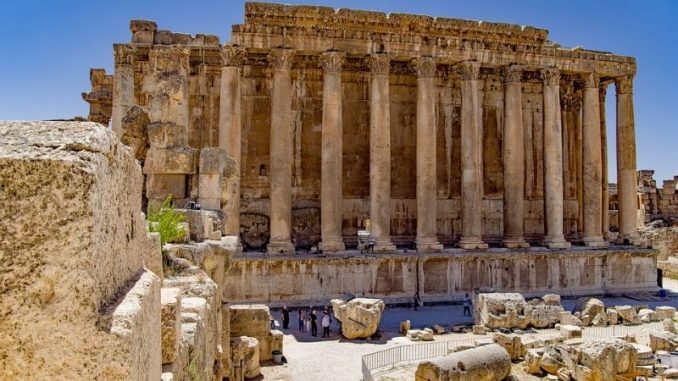 Locals told us on one occasion that ISIS had only been cleared from the area for a couple of months, the other told us that Baalbek is the hub of criminal activity in Lebanon and local gangs have previously kidnapped Westerners and sold them to across the border in Syria. When we left we actually saw these gangs when we drove through the Beqaa Valley. They dress like the army, have automatic machine guns like the arm, but they drive in random cars; we saw them in Renault people movers on more than one occasion. But I also want to reiterate, we had no trouble whatsoever and in reading other blogs before we left, nor have other tourists. The only thing that did make us curious were some gunshots in the distance, but we passed so many army checkpoints we assumed it was army bases. That’s the negativity out of the way; The temples of Baalbek are one of the most impressive things I’ve seen, if only because it was so unique to see something like this where we had the complete site to ourselves; It felt like a scene from Indiana Jones as we walked through the entrance arches and through the dusty ruins. Temple of Bacchus is considered the best preserved Roman ruin left in the world and is, in fact, larger than the Parthenon of Athens; I’ve not visited many Roman sites but the friend I traveled with has and she told me that while other ruins are larger in scale, this was her favorite. While the Temple of Bacchus is the grandest thing left standing, there are plenty of other remnants of the ancient citadel to see. Once inside, the Great Court opens up and all along the side, there are sections with greatly detailed carvings that have been protected from the elements. You can climb on an old structure in the center of the court for a fantastic 360-degree view. Then you can climb up to where the few pillars of the Temple of the Sun still stand. There is hardly anything left of it, unfortunately, as it was once over twice the size of the Temple of Bacchus. The ruins are really dominated by this temple and it is where you will spend most of your time. The hall of the Temple is still mostly complete and it a great place to hide from the sun. There is still Greek graffiti on the walls, but it doesn’t ruin its beauty. On the outside, you can walk a full loop under the pillars where you can see a few stone carvings still saddled between the walls and the pillars. When you decide to leave you exit through a tunnel where there are further relics and some information about how the site was pillaged in the past by foreign nations (for once not the British). You are easily able to hire a guide upon entering, we didn’t but I’m sure if you did it would be money well spent; we most likely missed a lot of interesting parts to the ruins that a good guide could point out. 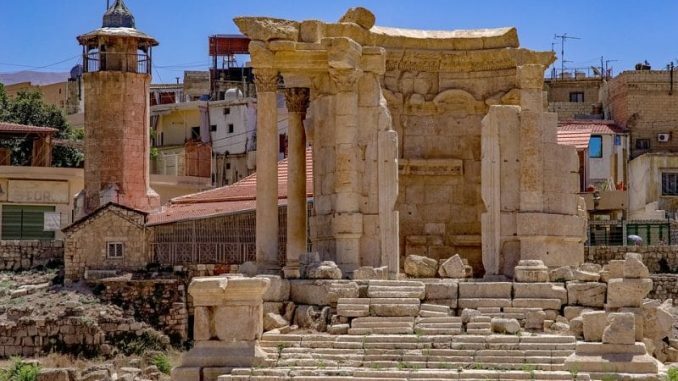 On the outside of the complex, there is also the beautiful Temple of Venus, which is different to the other temples as it has a large circular alter left standing. There are paths running around the ruins, but at the time of writing, they were not accessible. The road climbing the Beqaa valley was empty apart from the odd car filled with army clad militia and it was as bland looking and dusty as you can possibly imagine. But when you finally reach the peak, you begin to descend into a much greener landscape. We could see the Cedar forest on our way down, but it was so small we couldn’t believe that it was the right place to look; we expected thousands upon thousands of Cedars when in reality there are only a couple of hundred. The drive from Baalbek to the Cedars was about 1 hour and a half and Becharre, the hub for the Qadisha Valley, was another 20 minutes. The Cedars impressed us much more than I was expecting them to after I’d seen them from the hills. 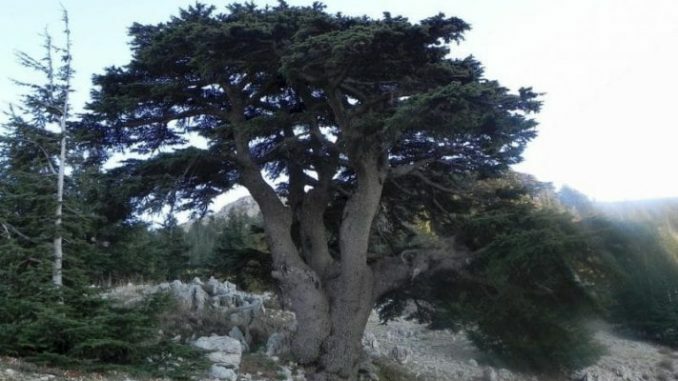 There may be so few Cedars that calling it a forest is a bit of a push, but the oldest living tree there is over 4000 years old and walking around the feet of the trees feels like a pilgrimage. People are quiet, the air is cooler here and not as dry and harsh on your throat. There is no entrance fee for The Cedars, but they do ask for a donation. No amount is recommended so we both paid $5 each and they give you back postcards to the equivalent value. As I said, it is only a short drive to Becharre from the Cedars. We actually stayed in a hotel about half way in between the two as it was cheaper. We stayed at Hotel L’Aiglon, which is right next to the Kadisha Grotto (shut at the time of writing). It was a copy of a ski lodge, perched on the hill with the most fantastic views of Becharre and the valley below it. I thought it was a good option for the price, but you do have to drive from here if you want dinner or a drink (the hotel does provide all this stuff). After the Cedars we went to stroll around Becharre. It is a pretty little town, again I can imagine in ski season it is very, very busy. But when we visited it was quiet and suited the incredible views which were the perfect backdrop to the churches around town. There isn’t much to do here, but it is a nice place. We spent an hour in a café speaking to a Lebanese couple who gave us information on how to access the Kadisha valley. In the morning we double checked without a hotel, the view there was so good they could actually point out the road we had to take down. It is simple, follow the road around as if you are traveling to Byblos and turn left at the church. It’s easy to miss the turning, so if you think you have gone too far just stop and ask a local as we did. The road down to the base of the valley is a bit hairy – it weaves around the cliff edge, if you get unlucky and have to pass a car on a narrow section it’ll have you holding your breath. We went early to avoid the sun and only had to pass other cars on the way back up. As you drive down the terrain gets greener and thicker with a brush, there were shades of green that I never expected to see in the Middle East. When we reached the bottom we passed over a small wooden bridge and over a gushing river before the road became only acceptable for a 4×4. We had no plan for the short hike we wanted to do. We had read there were many Monasteries to see as the valley has always been regarded as a safe haven for Christian monks, so we parked at the base and followed the road along the river until maps.me said there was a path off to the right. The climb was steep and about 400m. We passed a small place of worship where a Colombian hermit lives, the remains of an old watermill and tiny farms with enough crops to feed one person. It was difficult for a small climb, but when I reached the top I was so glad we had decided to do it. The mix of trees growing on the valley opposite was so stark, you could tell even from where we stood the difference from their different sizes, shapes, and greens. Somehow it reminded me of some of the mountains I’d climbed in China. The walk down was flatter and longer which was perfect as it gave us plenty of opportunities to appreciate the views. The whole loop took about two hours, but that was at a very casual pace. From the car, we visited a well-signposted monastery, which was now also a tomb and museum dedicated to the monk who once lived there. After that, it was on to the cross country hilly roads to Byblos; The oldest city in the world. 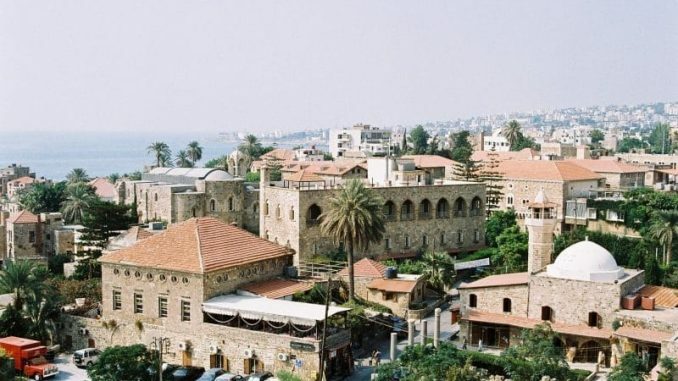 Byblos is considered the oldest constantly inhabited city in the world, with people living here since 5000BC. It was a perfect way to spend our last few days in Lebanon, with a real strong touristy vibe and a selection of beaches. 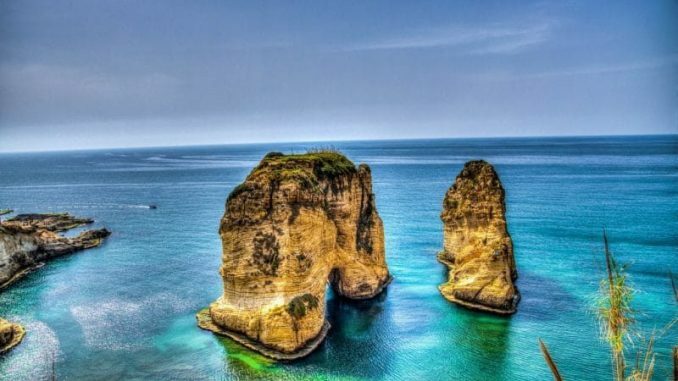 It is less than a two-hour drive along the coast to Beirut so on the weekends it gets busy with Lebanese people wanting to relax in the day and party in the evening. The city has a strong historical significance, with signs of Neolithic society through to Crusader times. 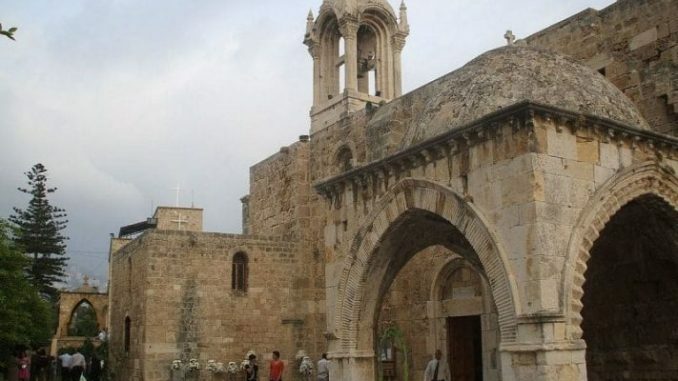 The main focal point of the town is its Crusader castle, which is huge and sits on a site that contains Roman and Neolithic ruins as well as the well preserved Crusader castle. It was fun just to stroll around the castle and climb to the top for views over the valley one way and the sea the other. The castle also contains artifacts that were found on site, some are even Egyptian. Within the castle grounds, there are many excavation points where you can see a Roman theatre, a Neolithic cemetery and even a more recent Lebanese house which overlooks the site from higher ground. It is easy to lose a few hours here as you’ll find you just keep coming across more interesting ruins. Outside of the castle complex, there are many old buildings spread around town, one of the best is the Church of St John-Mark which you are able to enter. The town has been managed perfectly for tourists with the old souks having their character maintained while also jamming it full of fancy restaurants and bars. At night it is very lively here, but expensive. The same applies to the food – you get much better value for money if you eat outside of the souks. They have also applied this to the old port, which is beautiful. The restaurants here are pricey but they do offer Lebanese food (The souk restaurants are overwhelmingly ‘international food’) and have lovely views over the sea. If you don’t want to sit here, it is a nice place to walk along the seafront. There is a small ruin of the old port remaining and if you don’t mind a bit old climbing over rocks, you can walk all the way to Edde Sands beach. This is one of two beaches we visited, this one has a small entrance fee, but it is worth it as it is a sandy beach – the other on the opposite side of the old town is free but stony. In our two days here, we spent one on the beach, the other seeing the sites around town. Both evenings we found a small bar in the Souks which sold draught beer, had wifi and gave the best table snacks we had in Lebanon. 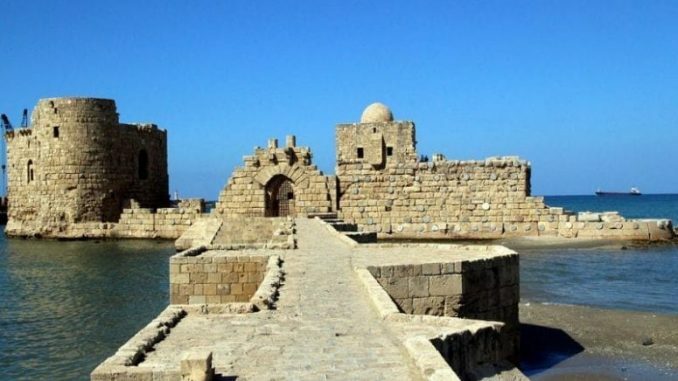 Byblos is so close to Beirut that in my opinion, you have to visit here if in Lebanon – it has the perfect mixture of history and culture with beaches and a real a real liveliness like Beirut. When we left Byblos, it was pretty much the end of our trip. The coastal road down to Beirut is a horrible drive, with people driving as insane as they do on the Beirut – Damascus highway. On our way to the airport, we took a detour to the Jeita Grottoes which is on the way to Beirut. We missed this at the beginning of the trip so wanted to stop and see it. I’ve seen a lot of caves in my time, and this is not anywhere near as impressive as others I’ve seen. 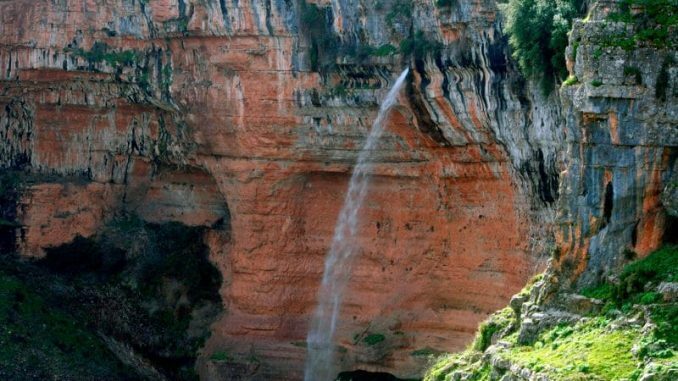 It is one of the most publicized tourist attractions in Lebanon, but I honestly think it is missable. Everything else we saw, however, was fantastic. Lebanon was such a surprising treat for us, we didn’t know what to expect, but it delivered on so many levels; history, culture, food and good beer. The temples of Baalbek were certainly my highlight, I feel so lucky to have seen the site with so few people there. Seeing the Kadisha valley from atop the deserty Beqaa valley was breathtaking and Byblos was just the perfect way to round off the trip. Lebanon should be jumping up your list, it’s just those roads you have to worry about!